More than 1,000 workers added their names to a petition to the public broadcaster, calling on the organization to send an investigative team to report on terrible working conditions and unpaid wages. The petition was organized by IndustriALL Global Union affiliate the Union of Metalworkers and Mechanics of Iran (UMMI), and addressed to Seyyed Mehdi, director of the Islamic Republic of Iran Broadcasting Corporation. The petition is significant, because independent union activists are severely persecuted in Iran, and it is rare for workers to publicly identify themselves as union supporters. 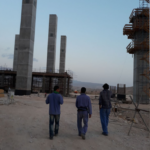 The workers of the South Pars Oil and Gas fields and the refineries of Bandar Abbas and Bushehr in Southern Iran submitted the petition because they face unbearable conditions. The oil and gas industry is controlled by the Ministry of Petroleum through the state-owned National Iranian Oil Company, the world’s second biggest oil company. However, much of the work is carried out through partnerships with the private sector – including foreign companies – and subcontractors. There are often several layers of subcontracting, and workers are employed through recruitment agencies on contracts with minimal rights. No salary is agreed, and they work a trial period of one month before their wage is determined. The oil companies pay the agencies, who regularly fail to pass on the salaries for months. Workers who complain are dismissed, and sometimes agencies disappear without paying wages. The oil and gas fields are based in a hot and inhospitable part of Southern Iran, away from major urban centres. Many workers live on site, in shared accommodation, with up to ten people sharing a small prefabricated building. Washing facilities are inadequate, and access to fresh food is difficult. Shifts are typically ten hours long in very hot and difficult conditions. There is a health and safety crisis, with frequent injury, illness and fatalities. Workers are crushed beneath machines, die from inhaling toxic gases, from boiler explosions and falls. Workers have held a number of stoppages and occupations to demand unpaid wages and recognition of their rights. Although these actions are sometimes successful, they approached the state broadcaster in desperation because the situation is so serious. The broadcaster has so far failed to investigate. “The workers in the oil and gas fields and refineries of Iran generate huge wealth for the country, and yet they endure terrible conditions. They are persecuted when they defend themselves.